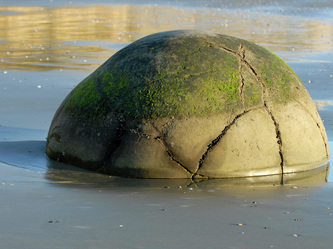 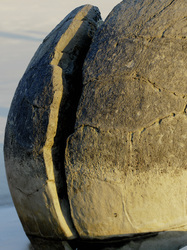 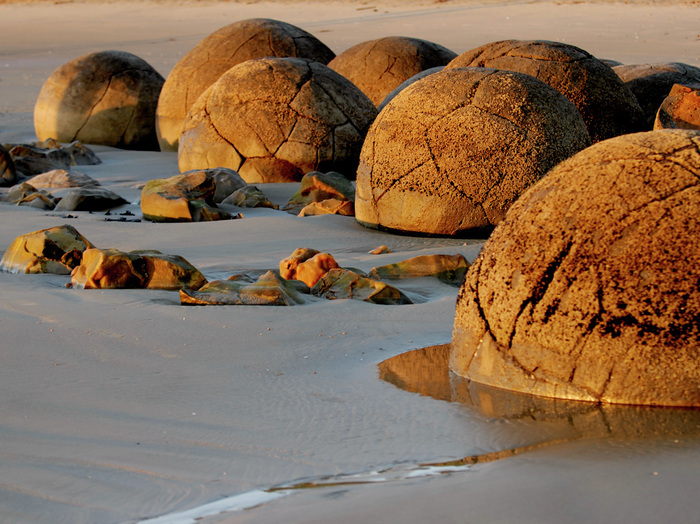 The famous Moeraki Boulders lie scattered along a stretch of Koekohe Beach near Moeraki, a small settlement just south of Hampden on State Highway 1. 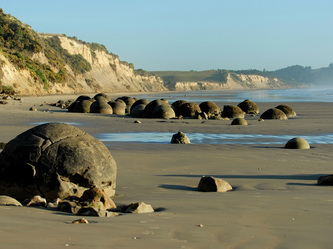 These grey-coloured boulders are remarkable for their size and roundness and have been exposed through shoreline erosion from the black mudstone cliffs that back the beach. The boulders originally formed in ancient sea floor sediments during the early Paleocene some 60 million years ago. At that time much of North Otago was covered by ocean. The muddy sediments, with fragments of plants and shells, accumulated on the sea floor. 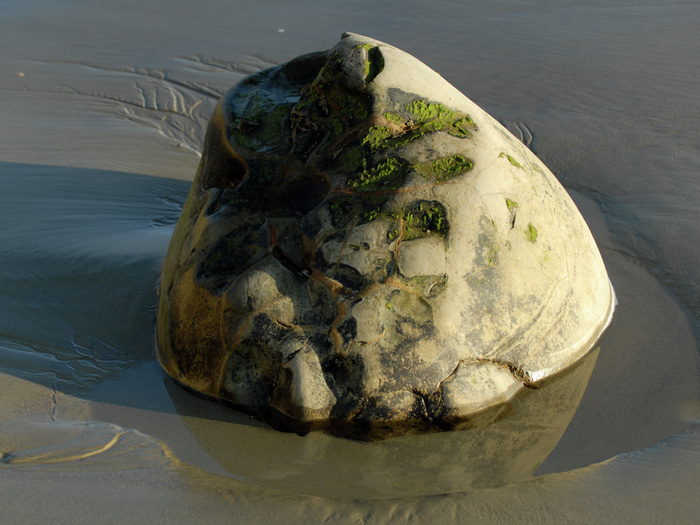 As the layers of mud piled up over millions of years, chemical changes occurred in the wet sediment . 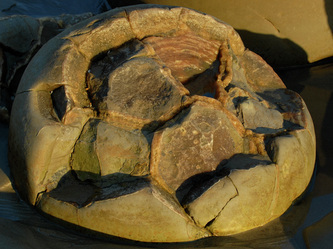 The cementing mineral calcite gradually crystallised around organic nuclei to form small spherical nodules. Geologist have calculated that it took about 120 000 years for a small concretion of about 50 centimetres across to about four million years for a large one (over two metres in diametre). 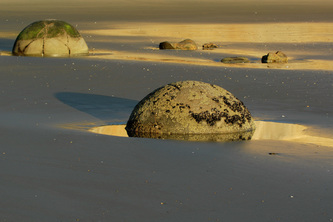 Some of the boulders weigh several tonnes and are up to three metres in diametre. The Māori people of the area (Ngai Tahu) relate the boulders to the wreck of the great canoe Arai Te Uru. 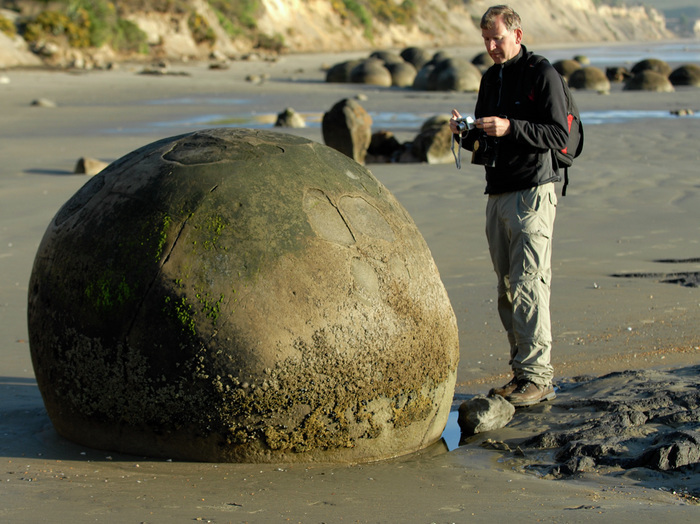 They are remains of calabashes, kumaras and eel baskets that washed ashore after this legendary canoe was wrecked at nearby Matakaea (now also known as Shag Point). 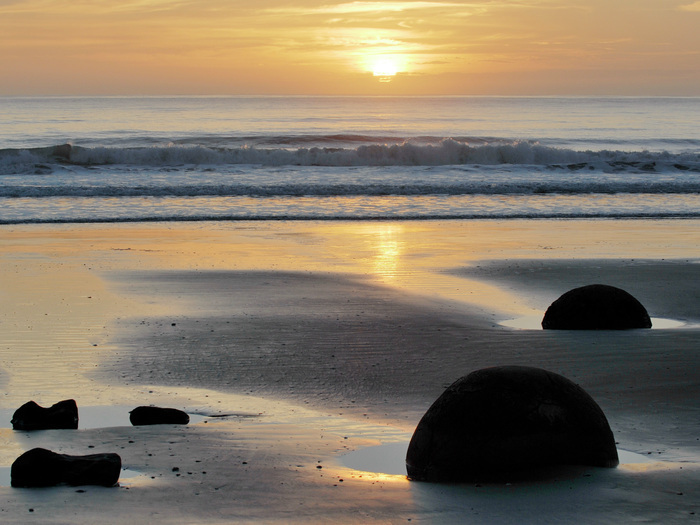 To the Māori the boulders are known as Te Kai Hinaki.